Do you know?? You are inhaling contaminants in your car. How? Air fresheners or alcoholic fragrances used in your car has got contaminants that causes allergy, asthma, headache, cancer and impotency on excess inhaling. Avoid! Contaminant odour – White Leaf, a natural deodoriser is 100% natural, Eco-friendly, recyclable and economic, works passively to eliminates odour inside your car and keeps you away from using fragrances or air fresheners. We believe in nature and harness it to the well being of humans. We do it by using the natural resources and presenting it aesthetically to fit in to the requirement. 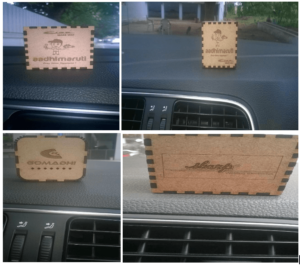 We, at present make natural deodoriser for cars. Our prime business is into charcoal and activated carbon. We have eight years of experience in supplying it for various industrial applications. With this application knowledge, we utilized this natural resource to meet the requirement of removing odour inside the car. Generally, we all could have bought or will be buying car for two prime reasons that is Comfort and Safety. Upon purchase, it became practice to add up accessories after buying a car and common part will be air freshener. By putting it unknowingly, we are compromising the objective of using car for comfort and safety. We tend to use this air freshener to remove odour and freshen up, but it never removes odour, only mask it and to extent usage contaminants in it cause you headache, allergy and other discomforts. In addition, plastic parts inside your car also start emitting benzene fumes when car is parked under sun. These fumes are dangerous and cause ailments too. Certainly, we won’ t be looking for this. Therefore, to utilize the car for its purpose, we provide White Leaf. It is hundred percent natural, emits no fragrance, recyclable and economic as well. This is a solution for above problem, which could absorb all odour and plastic fumes rather than masking it and helps to eliminate the use of air fragrance and gets you back the comfort and safety. One of the basic properties of activated carbon or charcoal is absorbing odour molecule in the air around it. Addition to it, it has tendency to leave off odour molecule when exposed to temperature difference. As car being naturally exposed to temperature rise and variance, keeping the raw activated carbon or charcoal inside the car will not solve the purpose. We customized it and employed in the car. With our years of experience and expertise in application, we applied the process to make activated carbon attain equilibrium state, which won’t leave off, absorbed odour molecule even when exposed to higher temperature differences. And this is how, White Leaf had evolved, to serve humans. As each application is influenced by different factors, we do R&D on various parameters, apply our experience and expertise to suit the product, best fit for the requirement, like what we did for car. Hopefully, we could be touching and enhancing the lives of as many individuals as possible, with your support.